Extracts from a narrative of privations and sufferings of United States officers & soldiers while prisoners of war in the hands of the Confederate authorities. Being the report of a commission of enquiry appointed by the U. S. Sanitary Commission. Illustrations of Southern chivalry as shown by photographic portraits of their prisoners of war. - With four photographs. Corporate Authors : U. S. Sanitary Commission. Philadelphia : King & Baird, 1864. Boston : Littell's Living Age, 1864. London : Alfred William Bennett, 1865. Description : 52,  pl. ; ill.,  plates ; 15 cm. Photographs : four mounted albumens. Photographer : A. H. Messinger [attributed]. Cited : Cordasco 60-1869 (trade edition). General photo size : 5.5 x 9 cms approx. Each photograph captioned : Photograph of a Union soldier after his return from imprisonment at Belle Island. A few copies of the unabridged edition also published with the photographs. Trade editions published with wood engraved reproductions of the photos. Edited by Mott, chairman of the committee to investigate abuses at Andersonville. Photographs of Union soldiers, after their return from imprisonment at Belle Island; taken at United States General Hospital, Division No. 1, Annapolis, MD. Printed from the original negatives now in the possession of the United States Sanitary Commission. It is the same story everywhere; prisoners of war treated worse than convicts, shut up either in suffocation buildings, or in out-door enclosures, without even the shelter provided for beasts of the field; unsupplied with sufficient food, or supplied with food and water injurious and even poisonous; compelled to live on floors often covered with human filth, or on ground saturated with it, compelled to breathe an air oppressed with an intolerable stench; hemmed in by a fatal dead-line, and in hourly danger of being shot by unrestrained and brutal guards; despondent even to madness, idiocy, and suicide; sick of disease (so congruous in character as to appear and spread like the plague) caused by the torrid sun, by decaying food, by filth, by vermin, by malaria, and by cold; removed at the last moment, to hospitals, as corrupt as the prison pens; there, with few remedies, little care and no sympathy, to die in wretchedness and despair, not only among strangers, but among enemies too resentful either to have pity or to show mercy. — report of the committee. The following notice appeared in issue #19 of The Crutch, May 14, 1864. This was a weekly four page newspaper printed at Annapolis Hospital where the POWs from Belle Island were treated. 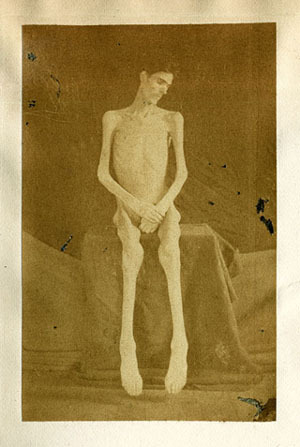 Let every one endeavor to secure one of the card-pictures exhibiting the condition of many of our paroled prisoners, immediately upon their arrival here — and then we wish to be informed whether any observer will consider the reports hitherto circulated, exaggerated or colored in the least. After you have looked at the picture yourself, send it to your friends, choosing first any rebel sympathiser you may know. We are positive that all boasters of Southern chivalry will be compelled to hide their heads for shame. We are glad that Major General Wallace and the Committee from Washington, on the Conduct of the War, when here last week, suggested the propriety of photographing the men in their actual condition as the best means of bringing before the people, the truth in the matter. ROSE, PARHAM, and BEEDLE have not died in vain. Their lives will be avenged. The physician with the handlebar moustache who is leaning into the patient is Bernard A. Vanderkieft, director of U.S. General Hospital, Division No. 1 (also known as Annapolis Naval School Hospital) where these photos were taken. 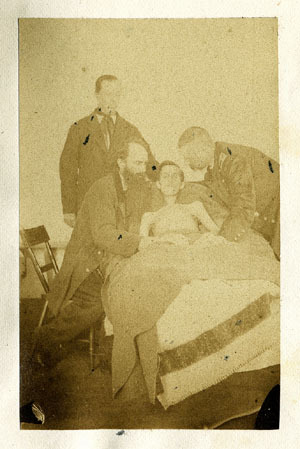 Prior to his commission at Annapolis, Vanderkieft directed Antietam General Hospital which was a temporary tent facility.